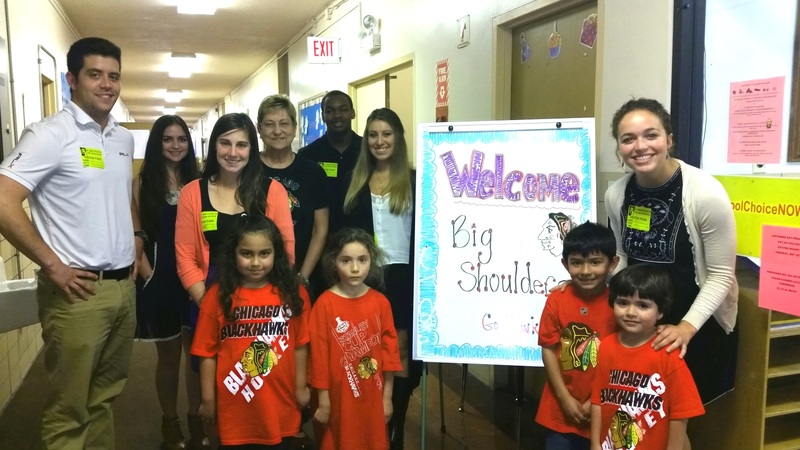 Big Shoulders Fund programs impact schools in a variety of ways. In 2015, St. Mary Star of the Sea (SMSS) School joined the Covered Schools Initiative, which provides a team of Big Shoulders staff and consultants to collaborate with the school on enrollment marketing, financial planning, scholarships, academics, and more. Enrollment has increased 49 percent since 2014–15, the deficit has decreased 42 percent, and 96 percent of 2016 graduates chose a Catholic or quality public high school. A participant in the Big Shoulders Fund Leadership Development Program, Usauskas receives financial support for pursuing her principal licensure and access to a network of mission-driven principals and mentors. When dealing with financial, ethical, or legal issues, my confidence is strong due to the course work I have participated in through the Leadership Development Program. The network of fellow principals has been accessible in times of need. If I have a concern about discipline or a school policy, it is reassuring to have a support group. Keeping up to date on trends and research will help make our school strong. The entire Big Shoulders educational team is looking out for us as principals to ensure we are at the top of our game. SMSS participates in the Big Shoulders Fund Math Initiative to bring rigorous curriculum and teaching practices to its students. Last summer we purchased new textbooks for grades six through eight. As part of the Math Initiative and its collaboration with the University of Illinois at Chicago, we receive the support of a math coach for the middle school teacher. The program allows us to work in a network of schools that have the same goal: improving math programs and test scores. The teacher receives professional development and collaboration and incorporates ideas she acquires into daily lessons. I am impressed to see the changes in her teaching style. She is more child-centered. The children own their lessons. The level of their math discussions has expanded. The Big Shoulders Fund Data Analysis Initiative provides SMSS with coaching on how data can best inform instruction, including a value-added model and surveys that gauge school progress from year to year. We have shifted to using the ACT ASPIRE to assess student learning. Thanks to the Data Analysis Initiative, we can use our professional development time to learn about the components of the test. We have begun to use data from the interim assessments to further drive student instruction and prioritized writing as an area for improvement. Through a partnership created by Big Shoulders, we gained access to the University of Chicago’s 5Essentials survey, which measures school culture and climate in effective leadership, collaborative teachers, ambitious instruction, supportive environment, and involved families. Last year SMSS was rated strong or very strong in all five areas. We surveyed teachers and students, and this year I hope to include parents. It is critical to have a strong school community with opportunities for interaction and feedback. I usually start my day by 6:30 a.m. to be available to speak to parents. I also walk through the school each morning for a quick assessment of the day, touching base with children struggling with assignments or specific subjects. With the Big Shoulders Fund Summer Fellowship and Marketing Support, SMSS has access to a variety of resources to help with enrollment building, fundraising, and community awareness. Monday evenings I often have planning meetings at school, and the marketing strategies I have acquired from Big Shoulders leadership have helped me more effectively get our name out to the public. Planning for fundraising is a large task, which takes time to build. I know that help is only a phone call away. Soon we will plan how best to use our Big Shoulders Fund Summer Fellow to help build enrollment and attract more community interest in our school. This story first appeared in the Spring 2017 Edition of Shoulder to Shoulder.